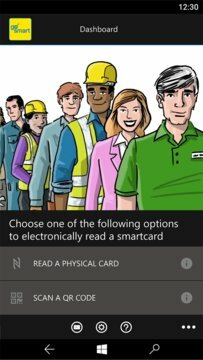 Go Smart is an app that allows you to check a cardholder’s details using NFC enabled Android smartphones or tablets or via a device’s camera by reading a QR code. Your device reads information either directly from the smartcard’s chip electronically or from a virtual smartcard’s secure, short-life QR Code and then surfaces this on your screen. This not only reduces the possibility of card fraud, but also makes capturing and storing smartcard details much quicker and more efficient. This app works online, accessing the most up-to-date information, as well as offline. So, if you cannot get a phone signal, you can still read the data on the physical smartcard or access the basic details from the virtual smartcard’s QR Code that proves the smartcard is genuine. Please note that this app requires newer models of the Lumia range, which use the enhanced NFC chipset (PN547) e.g. Lumia 735 or 830. 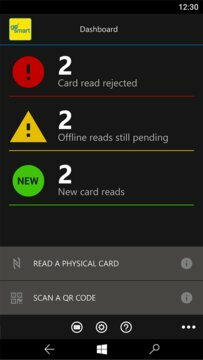 Older Lumia models, even with NFC, will not be able to read a card (unfortunately, the app is unable to detect this condition, and is therefore not able to warn the user that the card cannot be read). 5. Touch the Card Details tab to view the list of current qualifications. 6. Do the same with more smartcards if you need to. 8. Repeat this process to read more virtual smartcards. f.	Dashboard – takes you back to the main dashboard. d.	My Device Name – add a friendly device name that will be used to identify this device as the reader of a card.